type="video/mp4" Your browser does not support the video tag. Amity, at the south edge of Yamhill County on Highway 99W, was the middle ground between two families disputing on where to put a school. The name means friendship. Amos and Jane Harvey, pioneers of 1845, are credited with starting the Amity congregation with thirteen charter members. The first meeting may have been held just north at a town now called Whiteson. The charter members were Mr. and Mrs. Harvey, Enos C. and Willamina Williams, Barney Springer, Stanley and Salina Umphlett, Stephen and Louisa McKinney, Mrs. Carolina Buffum, F. W. Briedwell, A. P. Caldwell and Mrs. Eliza Lancefield. A post office was established at Amity in 1852. Writing to an eastern religious journal, Elder Harvey said, "We met, as the disciples anciently did, upon the first day of the week, to break the loaf, to implore the assistance of the Heavenly Father, and to encourage each other in the heavenly way." For more about Amos and Jane Harvey, see their separate profile. The second minister of the Amity Church of Christ was Glen O. Burnett, a pioneer of 1846. Soon after his arrival in the Amity area we find him busy preaching, baptizing, marrying and burying the citizens of this area. He performed his first marriage shortly after his arrival in 1846, in the cabin of Joseph Watt, another pioneer of the Amity community. Elder Burnett was a hard-working circuit rider. He was a close friend of Amos Harvey, and the two of them kept the Amity church alive in its infancy. There is a profile of Glen Owen Burnett. After first meeting in homes, the small congregation met in a log school house beginning in 1849. Later, Enos Williams gave the church a lot. A building was erected on the property in 1870. The West Side, a newspaper published in McMinnville, said in its February 21, 1871 edition that ". . . the Christian Church is not quite complete, they paid out $2,700 and it will cost them finished $3,300 . . ." That same year, they reported 60 members. During 1878, Bruce Wolverton was the circuit-riding preacher here. In 1881 the church reported 78 members. Enos Williams and G. A. Maddox were elders and T. M. Morgan was the circuit-riding preacher. Bro. Dr. Doty of McMinnville and the writer closed a meeting of sixteen days at Amity last Sunday night, 28 were added to the congregation, 19 by confession and obedience. One old gentleman, aged 82, raised up under Quaker influences was induced to obey the gospel. He was universally respected in his community and I believe all, saint and sinner, rejoiced when it was known that "Uncle Billy Buffum" had made the good confession. After he had been baptized he was as happy as any many I ever saw, and was largely instrumental in leading an old friend to the feet of the Lord. Original spelling has been retained. "Uncle Billy" was William G. Buffum, pioneer of 1849 from Vermont. Born in 1806, he had migrated to Illinois, married and then continued west. His Donation Land Claim was just east of Amity. The circuit-riding preacher in 1891 was K. H. Sickafoos. He also preached at Sheridan that year. At the end of 1893 he said he was beginning his fourth year with the Amity church. 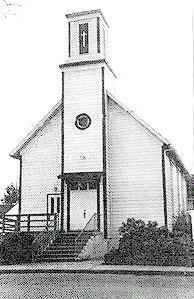 In 1892 the church moved to a location by what is now Highway 99W. At that time, it was by the wagon trail going south through Bethel and Monmouth. A new building was built in 1912 which unfortunately burned in 1928. That building was rebuilt in 1929 and stood until 1991. This writer led a tour group into the building just days before it was dismantled. Now there is a parking lot on the location and the old parsonage next door houses offices of the Amity School District. The church now has a spacious facility in the southeast corner of Amity on Goucher Street. In 1956 the Amity Church of Christ held a special service to commemorate the 110th anniversary of the founding of their church. Among the distinguished guests were the former United States Senator Maureen Neuberger (later Solomon), a great granddaughter of Amos Harvey, and her mother, Mrs. Ethel Kelty Brown, a granddaughter. Mrs. Brown unveiled portraits of Mr. and Mrs. Harvey. Mrs. Neuberger had been baptized in the Church of Christ at Amity as a young person and left a significant gift for the church in her will. This writer knew Ethel Kelty Brown (1874-1966) for many years. She was a faithful member of the Minnehaha Church of Christ in Vancouver, Washington. I conducted her funeral at Vancouver and the interment at the family plot at Bethel, originally provided by Jane Harvey. Dr. Jerry Rushford of Pepperdine University points out that from this small beginning with 13 members, the Restoration Movement has grown to 1,700 congregations in Washington, Oregon and California. The organizers of this transient country church were Vincent and Adelia Snelling, emigrants of 1844. The location was the home of Ruel and Elmira Olds. 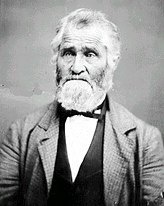 William Higgins, was the first man baptized into Christ in Oregon and that was on August 1, 1846, about four months after the Amity church was launched. Higgins, the son-in-law of the Snellings, was immersed in the Yamhill River, just below the home of Andy and Martha Hembree. The newly organized church began meeting in the school house about 1.5 miles northwest of Lafayette. Also baptized that month was Mahala Cozine. It is believed by those in the vicinity that the schoolhouse was later swept into the Yamhill river at flood time. One other founding member was Green L. Rowland, brother of L. L. Rowland. Later, Green became one of the founders of the Carlton Church. In his book Making Disciples in Oregon, C.F. Swander notes that a congregation existed at Roland (correct spelling), three miles north of Lafayette, in 1851. The church meeting at the school house and founded by G. L. Rowland is almost certainly the same congregation. Levi Lindsay Rowland had left this vicinity for more education during the 1840's. His father was Jeremiah Rowland (1805-1879). Pioneer Reminder: N.E. Roland Road; Cozine Creek and Cozine Lane in McMinnville. It was 1847, the year following the founding of the Amity Church, that Aaron (1789-1883) and Mary Payne organized 14 disciples into a congregation six miles northwest of McMinnville. Among these 14 were George William and Sidney Ann Burnett, brother of Glen Owen Burnett. G.W. served in the Oregon State Legislature 1868-1870. See the profile of Aaron Payne for more detail. Famous pioneers James R. and Mahala McBride owned a farm near the Payne's and Mahala's sister and her husband, Zebedee and Lavina Shelton, owned one down the hill from the McBrides. There is a profile of Dr. James McBride. For more on the McBride family, also see the St. Helens entry in Columbia County. James McBride was among the hardest working church organizers in northern Oregon. For at least a decade, he kept up the work of starting new churches and preaching regularly at ones that had been started. His vast acquaintance with those settlers from Missiouri made this work even more effective. The next year, a log school house was completed known as the Black Hawk School. The building can be seen in the computer enhanced photo at the left. It is a log building, built elsewhere and reassembled at this location. The building continued as a school as late as 1873. Dr. McBride had come west in 1846. His widower father, Thomas Crawford McBride arrived in 1847. He was 12 years older than Alexander Campbell and a highly respected frontier preacher with ties to John Mulkey of Kentucky. He had preached in Tennessee, then moved his family on to Missouri. After his children moved west, he moved to Yamhill County, preaching another 10 years before he died in 1857. See the separate profile of Thomas Crawford McBride. Pioneer preacher, patriot, editor and teacher William Lysander Adams arrived in Yamhill County fresh from Alexander Campbell's home and Bethany College in 1848. He taught school in Blackhawk School House and his students included the McBride children and their cousins, the Woods children. There is a profile of W. L. Adams. From that student body of 22 came one Oregon State Governor, one U.S. Representative, one U.S. Senator, one Oregon State Supreme Court Justice and five physicians. This group of capable, cultured pioneers met for church in the Blackhawk School House and in 1853 moved to the Shaddon School House, nearer the present McMinnville. In 1855 they moved again into newly established McMinnville. 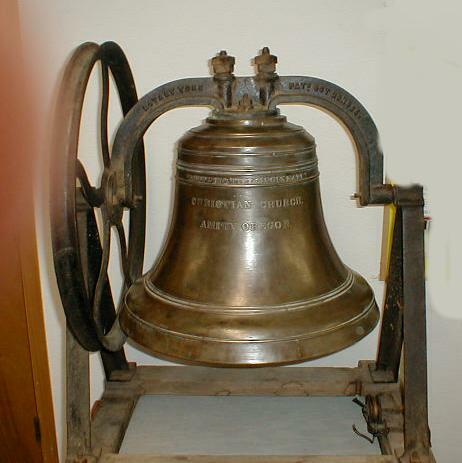 Pioneer Reminder: N.W. McBride Cemetery Road west of Carlton. In 1850, Sebastian Adams, "a pioneer teacher of prominence and power" settled in McMinnville and helped to organize the McMinnville College. He married Martha, the daughter of James and Mahala McBride. The fledgling college was launched in 1856 on land donated by William and Sarah Newby, pioneers of 1843. They named the town after his hometown of McMinnville, Tennessee. Joel Jordan and Sally Hembree, also from McMinnville, Tennessee, were among the early members of the church which dates itself from 1855. Their six year old son was the very first casualty of the very first wagon train in 1843. The story of Joel Jordan Hembree's brother A. J. is on this connecting link. Other pioneer members at McMinnville were: John and Narcissa Berry (1850), Levi and Mary Brock (1852), Judge J.W. Cowls (1852. He later married Lucretia Martin) John and Rebecca (Berry) Calhoun (1858 / 1852), Wayman and Nancy Hembree (1843), Daniel and Martha (Burnett) Holman (1843 / 1846), Isaiah and Mary Johns (1847), Franklin and Anna (Burnett) Martin (1846), William and Nancy (McBride) Morse, Jeff and Lucretia (Burnett) Nelson (1852), William and Elcey Toney (1847 / 1850), Cohn and Eliza (Shuck) Wallace (1847 / 1850). The earliest preachers were farmers or had other secular employment. As the congregation grew in numbers, the preachers were vocational, spending their full time on the Lord's work. Peter R. Burnett was likely the first vocational preacher. There was some preaching in the summer held in the grove of oaks where the McMinnville Library now stands on N. Adams Street. Other times, the church met in one of the college buildings until 1862 when it built on "B" Street near First. G. W. Richardson, the circuit-riding preacher in 1870 reported that the building was 36 x 56 feet. In 1890, after much deliberation, electric lights were installed. A new church building was built at 5th and Davis streets and completed in 1899. The building was debt-free by the time it was dedicated. After this building was badly damaged in the famous Columbus Day storm of 1962, it, too, was replaced. Pioneer Reminders: N. Adams St., Adams Elementary School, N. Newby St., N. Hembree St. It was also in 1850 that Absalom Bainbridge Faulconer built a church building at Sheridan, sixteen years before the town wore that name and fully thirty years before it was incorporated. The earlier name for the church may have been the "Antiock" church because one reported in 1863 from Yamhill County having 25 members and the report was signed by "Faulconer." The church building was along the river on N.E. Main Street. Faulconer was a pioneer of 1846 and one historian says "he was a lifetime member of the Christian Church." Since churches following the model of the New Testament only acknowledge believer's baptism, we must modify the claim to say that he had been a Christian since childhood. The same was true of his brother Marcellus F. Faulconer and his wife Caroline. The families had moved to Sheridan from Kentucky, coming by way of the Applegate Trail through southern Oregon. After coming overland in 1846, A. B. Faulconer and his wife Mary Ann built a hotel for hospitality. They always entertained travelers at no cost and feeding them if they were present at meal time. The original church included Kitty Davis, A.B. and Mary Ann Faulconer, Marcellus and Caroline Faulconer, Thomas and Lucy Faulconer, Mr. and Mrs. C. N. Simpson and Mr. and Mrs. T. J. Simpson. When Mary Ann Faulconer died in 1854, A.B. 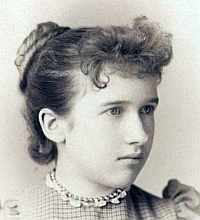 married Mary Jane Trullinger, daughter of Daniel and Elizabeth Trullinger of Rock Creek in Clackamas County. Other members before 1900 included Helen Burgess, Mr. and Mrs. Asa Childers, Mr. and Mrs. Jeff Davis, Mr. and Mrs. Davis, Mr. Tip Graves, Mrs. Laughlin, Mr. and Mrs. James Morgan, Mrs. Payne, Mr. and Mrs. Porter, Mr. and Mrs. John Stanfield, Mrs. Stone and Mr. and Mrs. Turner. T.F. Campbell of Monmouth was involved in leadership here at a very early date. For the years 1859-1861 the A.B. Faulconer family of eleven moved to Spring Valley, near Bethel, so the children could attend the highly regarded Bethel Institute. Marcellus and Caroline moved to Oretown on the coast for 14 years before returning to Sheridan. The original church building had but one room and one door which was located in the south, the pulpit at the north, with a round barrel type stove in the center for heating. As was the custom in that time the men would sit in pews on the left side and the women were seated on the right. (No chance of holding hands that way!) It is recorded that the Yamhill River was the baptismal ground for early members, and at one time the ice had to be chopped away in preparation for a lady's baptism. Sheridan, Oregon, June 8, 1868. Dear Bro. Pendleton: A brief tour in Oregon discloses a religious destitution that is perfectly overwhelming. I do not know of one Baptist or Christian pastor who is fully devoted to his work, on a single field, and is sustained adequately by the people to whom he ministers. Preachers generally itinerate. They go on a circuit, supplying four or five churches, visiting each once a month. I am now attending such a monthly meeting at Sheridan, with Eld. G. W. Richardson, of Bethel. Eld. G. 0. Burnett, of California, is also here. The word preached has been mixed with faith in some hearers. Three have yielded to Christ, and the immersion of two Methodists today, has ended their doubts on the subject of baptism. . . .
Millennial Harbinger, 1868, page 535. - Old Bro. John Cyrenius formerly of Ashland county, O., but now of Sheridan, Oregon, has made us another visit. He is in fine health for a man so far advanced in life. He preaches every Sunday; twice per month at Sheridan, once at Willamina, and once at Bellevue. Bellevue is four miles NE of Sheridan on Highway 18. James Logan was the preacher in 1890 and K. H. Sickafoos was the circuit riding preacher in 1891. The church was incorporated with the State of Oreon on December 3rd, 1889 by R.A. Porter, T.N. Faulconer and O.G. Davis. In the spring of 1893, S. W. Glascock was the circuit riding preacher. The Sheridan congregation still exists today. Pioneer Reminder: N.E. Faulconer St. Historian Doug Dornhecker reports this congregation as having been located about seven miles northwest of Newberg. There is reference to the congregation meeting as early as 1854. The post office was in existence from 1865 - 1900. The group reported 18 members in 1871. While Grand Ronde is in Polk County, the Grande Ronde Indian Agency is just across the county line in Yamhill County. The venerable Amos Harvey moved there about 1864. He was 65 himself that year and was working for the U. S. Government as an Indian Agent. A Christian Church in the community traces to that time. Mr. Harvey was in Grand Ronde until his retirement in 1869. A local historian believes that Mr. Harvey made use of a church building across the creek from the Indian Agency. The writer summarizes with these words, "He would have had followers from among the Whites, but any allegiance among the Indians has left no trace in writing or memory." There is more detail about Mr. Harvey at Grand Ronde in his profile. Amos Harvey's work lasted more than a decade after his departure. In 1871, they reported 50 members and the Christian Church reported from there in 1881. G. W. Bronson was the preacher that year. By proper exertion, all of the churches in the county can be supplied with preaching at least once or twice per month. The congregation at Amity is ready, willing and anxious to have preaching twice a month. They have social meetings twice each month. Why cannot Sheridan and Webfoot, and if necessary Bethel, assist in procuring the services of someone to devote his whole time. Webfoot Road begins at Hopewell and goes north toward Dayton. The congregation was a mile or so north of Hopewell on Webfoot Road. A post office was established at Hopewell in 1897, but lasted only six years. But long before the post office, the church had been meeting and may have had its own building. In 1871 they reported 30 members. William Rucker McCarty, brother of A. V. McCarty, lived in the neighborhood and may have attended this assembly at one time. Members of the Matheny clan had settled here and some of them were identified with the Christian Churches. 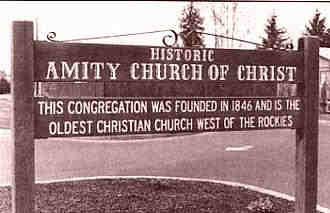 The church may have disbanded in the 1880s because it is not listed in an 1887 listing of Christian Churches in Oregon. Mr. Brown, a local historian, believes that the members of the Christian Church formed the nucleus of the present-day Hopewell Community Church. The Carlton Christian Church was organized through the leadership of Jasper Jesse Moss. Mr. Moss came overland about 1870 and led in establishing the Carlton congregation in 1877. Other charter members included Green L. Rowland and his wife Sophronia. Green helped with the building construction and is buried next to Aaron Payne in the Yamhill-Carlton Cemetery. John W. Shelton and his wife Mary Jane were charter members. When she died, he married Mary Matoon. He is the son of Zebedee Shelton. Mary Shelley Sitton was a charter member as were James and Celia Caldwell. He became an elder. Isaac Davis and his wife Margaret were present at the beginning. He was became an elder when the church was organized. Thomas C. Davis and his wife Nancy Ann were there. John Thomas Fouts and his wife Frances were members. He was an elder from the beginning of the congregation. The church may have been reorganized, because they gave their own date of organization as 1894. At one time the county seat, a small church existed here for a while beginning in 1855 where it is mentioned in the Millenial Harbinger. It reported 29 members in 1881, with H. Allison and A. C. Denney as elders. Peter Rogers Burnett was the circuit-riding preacher, coming on the second Sunday of each month. The church used the building of the Methodist Episcopal Church. They were still meeting in 1893 because A. D. Skaggs reported to the Christian Standard that he was going to hold a protracted meeting for them. the annex of the present building. In the early 1870's a Christian group met and held worship in a small building in North Yamhill, the older name for this community. It was in a building on the Thomas Crawford Davis farm. Mr. Davis was a grandson of Thomas Crawford McBride. The church soon moved to a school house built in 1874. The church considers its official organization date to be July of 1877. 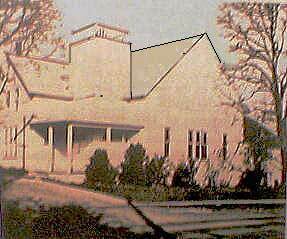 In 1881, the North Yamhill Church Building Association was formed by the leaders of the Methodists, Baptists, Christian and Presbyterian churches to build a union building and each group used it once a month. That property was also provided by Thomas C. Davis. The arrangement was transient as each group soon built its own building. The Christian Church group gained control of that building and also purchased an unused Wesleyan Methodist building, meeting in it for a time. Early records show a Christian Advent Church meeting in homes, but it disbanded and some of the same names showed up on the rolls of the Yamhill Christian Church. Aaron Payne and J. A. Campbell were among the pioneer preachers here. Among the pioneer members were Isaac and Sarah Davis (overland in 1852) and Thomas and Margaret Ann Davis (1847). Charles Vos and Elizabeth Jane (Davis) Kuykendall (overland in 1870, 1855) were probably members, too. They are buried at the Pike Cemetery and their listing can be read online. The Davis' were descendents of Thomas Crawford McBride. The town was named by Joel Palmer and Andrew Smith after Smith's former home in Dayton, Ohio. The town developed a waterfront along the Yamhill River and became an important shipping point. At first, boats were propelled by Indians pushing on the banks with long sticks. Soon steam replaced the hand power and a brisk trade developed with the three-times-per-week boat trips. See the photo of The Relief taken near Dayton. The Dayton Christian Church gives its own date of founding as 1890. Blashel Foster and his sons George and William were early members. George married a daughter of Robert Addison, while William was married to a daughter of William Hibbart. (Notice they married within the Faith.) These were among the early Christian families that moved here from Illinois. In 1894, George Foster signed a mortgage for $800 in payment for the church building and a house on the property. The building still stands, interestingly wrapped into a larger structure serving a larger number of believers. A. D. Skaggs was the first minister. Others were Isaac Newton Mulkey and K. H. Sickafoose. Fans of Teddy Wyatt Leavitt should note that while he was attending High School in Newberg (1912-1913), he preached at Dayton. This is a great example for young men in our time. Pioneer Reminder: S.E. Foster Road. In the earliest pioneer days, the post office of Chehalem stood on the spot now occupied by Newberg. 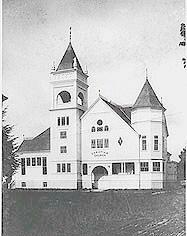 The Newberg Christian Church uses 1907 as its opening date, but the Christian Herald mades reference to a congregation is East Chehalem in 1882. The Millennial Harbinger made mention of a congregation in Chehalem in 1855. It was probably a country church. The receipts of the 1890 Oregon Missionary Convention show receiving $12.60 from "Newburg." The group may have ceased meeting after this because an effort had been made to establish a congregation in 1893, according to historian C. F. Swander. This was just four years after the town was established. As a result of an evangelistic meeting held in Carter's Hall by Evangelists George and Arthur Ritchie, the church was organized with 38 members. The resident minister at that time was William Kellaway, just moving from Corvallis. A building was erected on Howard Street in 1908. The site was later occupied by the IOOF Hall. Using 1907 as the beginning date, then George K. Berry was the first minister of the congregation. Mr. Berry had arrived in Portland from Helena, MT in the summer of 1890. He was born in 1854 in Washington County, VA and was immersed into Christ by G. W. Mapes in Macomb, IL in 1876. He graduated from Christian University in Canton, Missouri in 1882 and five years later was married to Ida Vail of Charleston, Illinois. One writer who knew Mr. Berry said "he was a large, well-proportioned man, who usually wore a grey suit with a long-tailed coat, a stiff-front shirt and a white bow tie. His favorite expression was 'This is my opinion, take it for what it is worth.'" A 1912 map shows the Newberg Christian Church building at the northwest corner of Dayton Avenue and S. Washington St. It was next door to the City Hall.